If your Instagram feed was flooded over the holiday break with festive and poetic proposals, you’re not alone—December is a sweet spot for engagements. But it’s the few crucial months after the romantic gestures end where the real action happens. 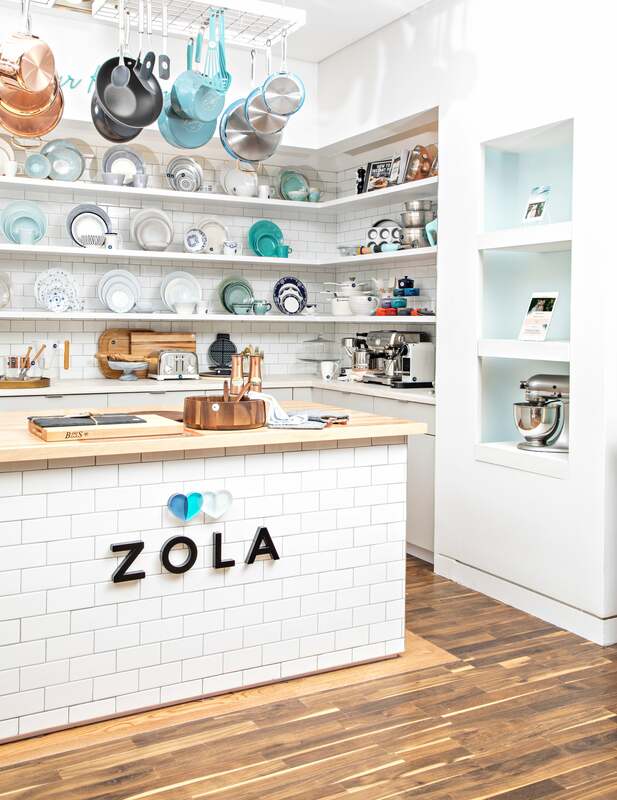 Amidst all the chaos, Zola, the one-stop online shop for wedding planning and registry, is out to streamline the process with an IRL pop-up store in New York City’s Flatiron District. The store plans to keep its doors open through June when the planning rush dies down. Designed to help couples check off every task on their to-do list in under an hour, the two-story space boasts everything from an impressive gift selection to a 3-D printing cake topper machine. There’s also a CBD lounge for when the stress of selecting a KitchenAid mixer becomes too much and even the same rotating closet featured in the movie Clueless—just because. Suffice it to say, the 5th Avenue space isn’t just a paradise for couples who are taking the next step in their relationship, but it’s a source of inspiration and relaxation for passerby. Got a free lunch break? Here’s what to do when you get there. Registries are Zola’s bread and butter. With over 2,000 of its best-selling wedding gifts to choose from, couples can see and touch every item they want to add to their gift lineup. Though the coolest feature in the store has nothing to do with weddings at all. For a movie-worthy moment, head to the bed and bath section, where you can flip through linen samples that hang from the same rotating closet that famously belonged to the character Cher in Clueless. You’ll also find personal stories and mood boards from real couples who used Zola to plan their big day scattered about the store for an extra dose of inspiration. There are over 150 designs of “save the date” and wedding invites to pick from—so take a seat and select your font. Not sure about a first-dance song? What about a processional song? Hop in Zola’s wedding playlist booth and check “music selection” off your list. Who needs a photographer when you can capture the moment in a cake topper? Zola’s 3-D printer lets you create a lifelike version for your dessert of choice. Forget City Hall: Tie the knot on the spot. All the Zola store associates are ordained, so you can technically skip all the planning and jump straight to the finish line.